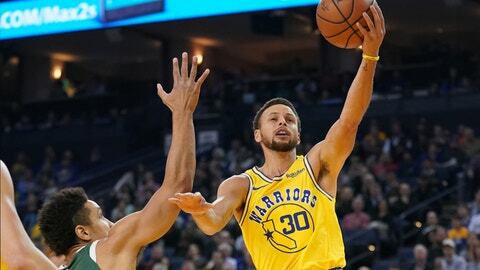 OAKLAND, Calif. (AP) — Stephen Curry won’t play during Golden State’s three-game Texas road trip as he recovers from a left groin strain, though he is traveling with the Warriors. The team traveled Wednesday to Houston, where the two-time defending NBA champions will play Thursday night. They have games Saturday at Dallas and Sunday at San Antonio. Curry was injured during a Nov. 8 game against the Milwaukee Bucks and has been sidelined the past three games. He is scheduled to be re-evaluated in 10 days. The team says he continues to be monitored by the medical staff as he rehabs from his latest injury. The two-time MVP played in only 51 regular-season games last season because of a left knee injury and a sprained right ankle. He returned from the knee injury for Game 2 of the Western Conference semifinals after sitting out the first round of the playoffs. Curry, 30, is averaging 29.5 points, 6.1 assists and 5.0 rebounds while shooting 49.2 percent from 3-point range.